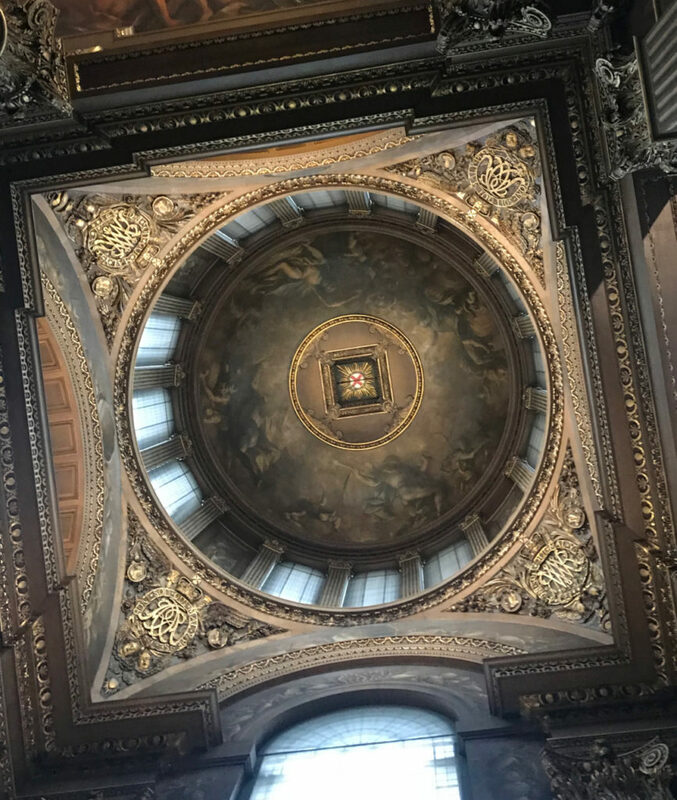 James Thornhill is sometimes called “the English Michelangelo”, although that’s less to do with a comparability of talent – he’s good, but he ain’t that good – than with the fact that he painted a lot of ceilings. 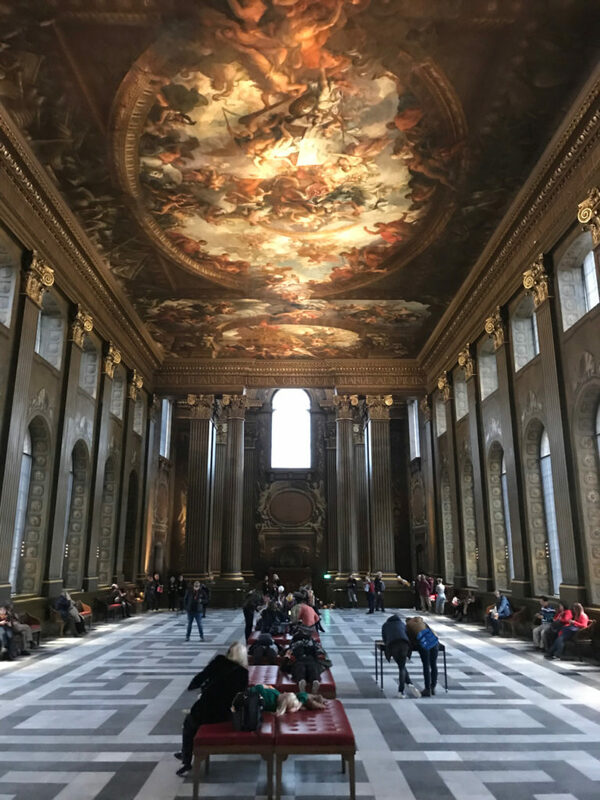 Examples include the Great Hall at Blenheim, inside the dome at St Paul’s, the ‘Sabine Room’ at Chatsworth and, firstly and most conspicuously, the Painted Hall at the Old Royal Naval College at Greenwich. Emerging from a two year and £8.5 million restoration, this 300 year old artwork has come up, well, as fresh as paint. Originally the dining hall of the Naval Hospital (and later the Officers’ Mess Hall of the College), this is also where Nelson’s body lay in state before his funeral at St Paul’s. 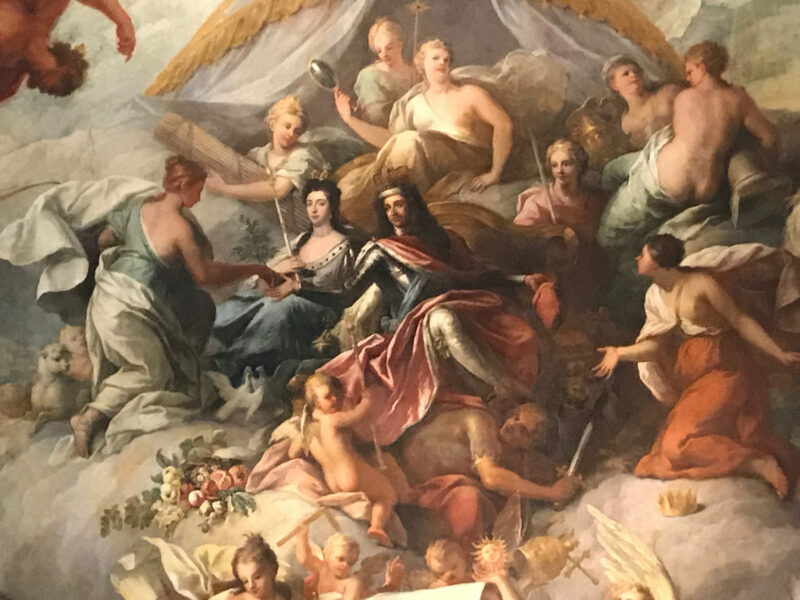 The paintings celebrate the triumph of Protestant England over the venal and tyrannical European – particularly French – catholic monarchies, with the late Stuarts – William and Mary, Queen Anne – and George I receiving the grateful thanks of various Virtues. They also commemorate the power and success of the Royal Navy and the supposedly uniquely British values of liberty and good governance. Starting in 1707, it took Thornhill 19 years to complete and he became the first British artist to be knighted (as well as trousering £7000 – £1 per square yard for the walls, and £3 for the ceilings). The restoration of the building (work has been done to the Undercroft to convert it to a cafe and shop) also revealed part of the old Tudor Palace which can be seen from the staircase. This includes ‘bee boles’ – niches in the building where bees would hibernate over winter. You can also see (and play on) the 19th century skittle alley used by the naval pensioners (and, subsequently, the RN officers at the College). It’s a remarkable restoration of a remarkable artwork, my only reservation being that it now costs £12 to visit (although, to be fair, that ticket gives one unlimited entry of 12 months). You can find out more and book tickets here. William and Mary, with ‘Tyranny’ (basically, Louis XIV of France) crushed under the stocking leg of William. Note the papal crown and the sun (Louis was the Sun King) falling to the ground. George I, the first of the Hanoverian kings with his son (later George II) standing in armour to his right. Bottom, by the column in a grey wig, is Thornhill himself. 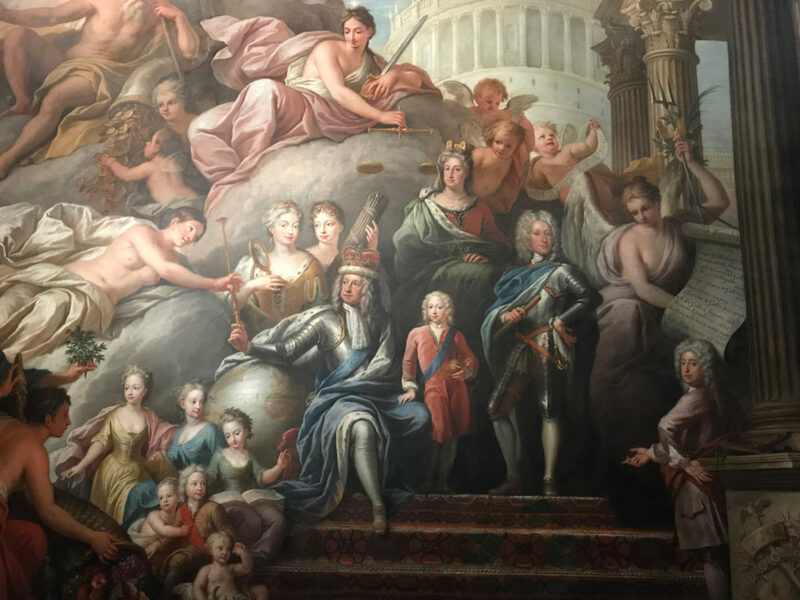 This entry was posted in The Blog and tagged greenwich, painted hall, thornhill on 22/03/2019 by donbrown.